The word Navajo can be traced all the way back to the Tewa word “Navahu.” “Nava” is believed to be an ancient word for cultivated field and “hu” meaning the mouths of canyons. Navajo Indian tribe history as we know it began in northern New Mexico, where a large tribe broke off into what are known today as the Navajo and Apache people. The Navajo settled down in several areas of the Southwest, while the Apaches continued as nomads who raided and lived off the land. Navajo Indian tribe history can be traced to prehistoric times. The tribe largely consisted of of hunters and gatherers until Navajos made contact with Puebloans and Spanish and adopted crop farming of squash, beans and corn. They later began herding sheep and goats. Herding became a major source of trade and food for Navajos. During this period meat also became an important part of the tribe’s diet. Wool was used for weaving blankets and clothing. Legend has it the tribe learned the art of weaving from a spider woman who lived on top of a mountain. As the technique improved, weaving became a valuable form or art, which is still highly sought after today. The tribe did not make official contact with the United States government until 1846, when a general invaded New Mexico during the Mexican American War. Despite a peace treaty, a series of raids on both sides inflamed tensions between Americans and the tribe. In 1861, another general in New Mexico launched military raids against the Navajo people. Backed by New Mexican militia volunteers, the general swept through Navajo land, killing the people, burning crops and destroying houses. With starvation and death looming, the Navajo surrendered and were forced to walk more than 300 miles to Fort Sumner, where they were interned. 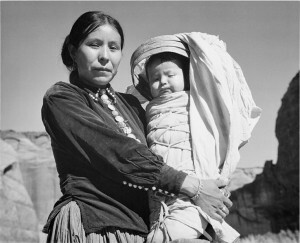 It was a dark time in Navajo Indian tribe history. The internment at Bosque Redondo was a catastrophe because the U.S. government failed to provide basic needs, such as adequate wood, water and livestock. The government also brought Navajo enemies such as the Mescalero Apache to the area, which caused a series of conflicts. From 1923 until 1968, the Navajo Nation was called the “Navajo Indian Reservation.” Today, the Navajo Nation is a sovereign nation with its own government that stretches across the four corners region of the American Southwest.